I started our letter of the week in dramatic fashion: I took a snake we had made with discarded Brands Essence of Chicken boxes to our garden and pretended to be really freaked out by it. Cos, well, you know, S is for scared and snake. Haha. Anyway, while Q thought it was really funny and mimicked, it kind of had a reverse effect cos now all he wanted to do was play mummy’s Snake in the Grass game and not do some boring sit at a table with glue and paper thingamajig. I gave up trying to coax him to settle to crafting and we ended up looking for a snail or two, cos snails also start with the letter S. the good thing about having a garden is there are usually a snail or two somewhere and true enough we found a couple of snails though one was kinda (S is also for) smashed up. A little gross but I don’t think little boys are bothered by that much. We got to our letter of the week craft the day after with little fanfare though it gave us a lot of talk about while working on our craft. Not a bad thing and I found myself thinking that maybe I should do more drama stuff as introduction. Seems like fun. 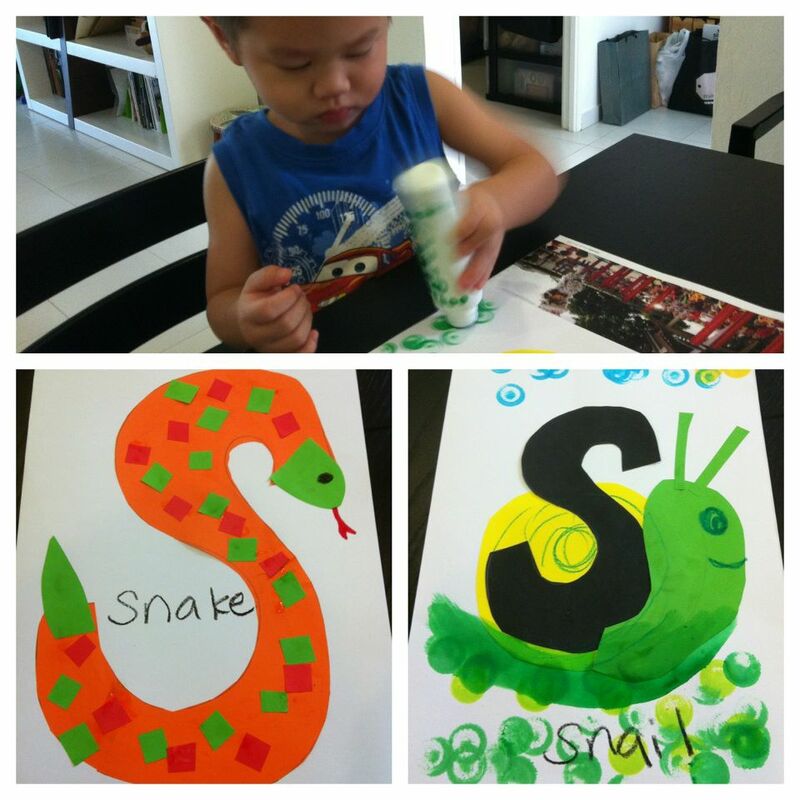 So, S is snake, snail, sun, star and school. We got off to a late start to our letter of the week work this week cos, well, mummy’s schedule has been (R for) ridiculous lately but it was a big (R for) rainy day when we discovered a leak spot on the roof of this old rental house of ours that I thought it’d be a good idea to get to Letter R since we were all grouchy at being rained in. Our rooster craft went down a little less eventful (read: less explanation) though we had to stop several times to make “cockle-doodle-doo” noises. 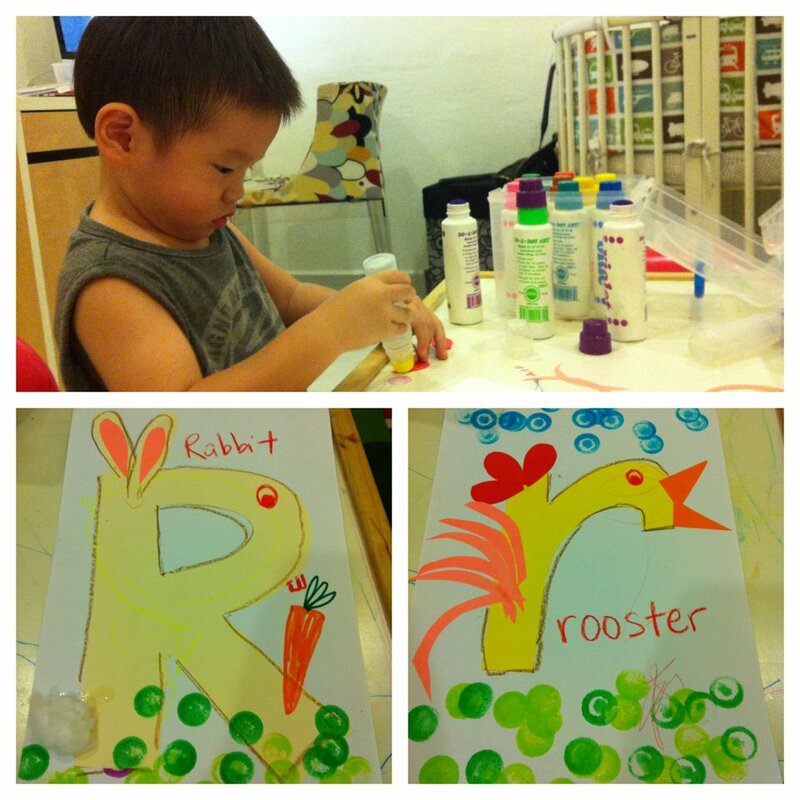 R is for rabbit, rooster, rain, radish (which I made Japanese style that night) and reindeer. Those who know me know what a big crafter I am. Strictly speaking, while I do scrapbooking, I don’t scrap as much as I craft. I make things: cupboards, books, pots, diaper and towel cakes…etc. thanks to my meeting some truly amazing craft-loving charity-minded people; the chance to be part of a myriad of craft based charity work came about, I jumped at the chance to get wholly involved. Our first project was in partnership with the Make a Card Campaign for the Needy. Most recently, their Valentine’s Day cards were donated to several charities who in turn, sold them to raise funds. There was a recent call for a new card drive for “Thank You” cards; most of which are for charities as they gear up for International Volunteer’s Day (3rd quarter) and some to be curated and packaged for sale at various fund raising events. I knew that many of my friends feel that they don’t have a clue how to begin, so I decided to take the guess work out of card making for them and created card kits (of varying difficulties). These are complete kits to make/assemble 10 cards- all they would need is craft glue. The designs are also simple enough for toddlers to get involved to. And my team of colleagues gamely chipped in to make the said packs with me! I roped in my mummy’s group who all enthusiastically joined in. Some had never crafted in their lives, some brought their little ones over and in the midst of playtime and catch-up chats, we crafted. So many that I now am able to route some to other causes. At last tally, we will make close to 450 cards amongst the group of us, far more than expected and I now have enough to route to other charities that have use for them. If you haven’t already figured it out, we love the zoo. WE LUURRVVEEE the zoo and whenever possible, I start letter of the week at the zoo and since its been a while (read: two weeks) since we last went, I packed the troops and toddled off to see the P is for penguin and P is for Parrot. 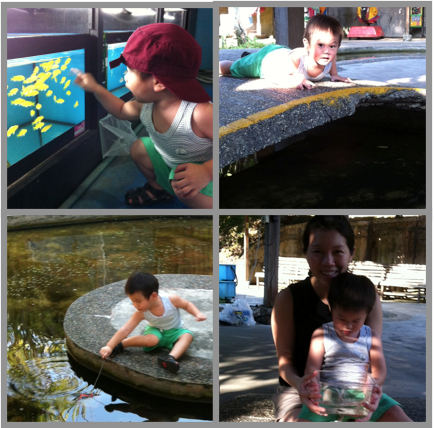 We always “review” our alphabets at the zoo; you know L is for Lion, C is for cheetah, F is for fish… you get the drift. So that always makes for a fun learning day at the zoo. Anyway, we opted to take a little more time to look at the penguins and parrots. In particular, we chatted about the time we went and fed the parrots at the Farmart a few weeks back. Q has asked to go back to feed the “faraway parrot” (cos, well, the parrot was standing faraway from his perch, funny how kid’s mind work) several times so maybe we’d do that some time. I picked making a penguin and a parrot, complete with an array of colorful faux feathers for our letter crafts and towards the end of our crafting, Q declared: P is for Peeing! Ah… maybe we are getting somewhere with our toilet training. O was an easy letter for us to tackle seeing as he already knew the number zero and, well, zero and the letter O looks the same. And of course, there is knowing the shape Circle. So he had already known the letter O for a while, but it was good fun exploring the letter anyway. It was a long week so I opted for doing something simple: and if you must know, I took out the newspaper and armed each of us with a do-a-dot each and set out to “find as many Os” as we could in the papers. After we made a colorful mess of the day’s newspaper, we went about drawing happy faces in the bigger Os that we could find. That kinda dwindled into making thumbprint faces cos our thumbprints- or rather, Q’s more than mine, kinda look like an O anyway. I recently took receipt of a wonderful book by Ed Emberley, the father of fingerprint art too! O is for orange, ostrich, octopus and owl. I was particularly excited to do our letter N craft mainly cos I had spent a long time cutting the blasted pieces and planning on how this was gonna go. We had spotted a little bird’s nest at my parents’ house and that was the (unexpected) initiation to our letter N week. I had originally wanted to build a full on bird’s nest but decided that was a little more than I was willing to go through seeing that I was having a really hard work week so we stuck to just making a paper version. Which worked out pretty well seeing as Q liked sticking the little pieces of paper down. Originally, our little n craft was meant to only be a needle, but after sticking the needle down, it looked a little bare and I had just finished wrapping several birthday presents so I made some noodles! And to wrap the day, Q made himself some cup noodles for snack!